Keep up to date with the latest happenings at Pomoto. The Pomoto application requires technology which was removed from OS X 10.6 (Snow Leopard). Because of this, I have decided to disable the download link for Pomoto. This will have no effect on existing galleries or current users who continue to use the service with earlier versions of OS X. If you are a current user and considering an upgrade to Snow Leopard, please note that there will be no way, for the foreseeable future, to publish new albums and photos. I am considering a 'next generation' Pomoto which would of course run on Snow Leopard, but I can't make any promises and certainly can't give any timeline or roadmap. If you have any questions, please don't hesitate to contact us. Our recent 1.3.1 update was unfortunately broken for all users running Panther (OS X 10.3). We've just released Pomoto 1.3.2 which should fix this issue, and I'd like to apologize for any inconvenience this has caused. In an effort to offer potential users a more realistic introduction to Pomoto, we've significantly reduced the limitations of our trial account. We've lengthened the trial period from 15 to 30 days, and the 50 photo limit has been completely removed. That's all this time, now get back to publishing! New Themes 'Basic Charcoal' and 'Basic Onyx' for a darker look. Updated all themes to not crop the key photos on your homepage. New preference for controlling the order of homepage key photos. Fixed major issue with publishing GIF images. Fixed major issue with certain early versions of iPhoto 4. Fixed issue with non-ascii characters in your Facebook profile. Facebook users rejoice... we've just released our new Facebook application! Simply add the application to your Facebook account and then log in to your Pomoto account. Your profile will immediately display a configurable number of your most recently added albums, and your friends will be notified whenever you publish new albums. New source list indicators for private albums, making these more recognizable. Bugfixes for accounts with usernames containing dashes, underscores and capital letters. Bugfixes for the last remaining users of iPhoto 2. Your main meal is an update to Pomoto. 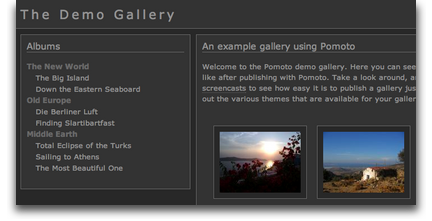 We've just released Pomoto 1.1 with some nice new features to make publishing your gallery that much easier. Top of the list is a dramatic speed-up of the 'Preparing to Publish...' phase of publishing your gallery. After an initial publish, you'll be treated to lightening fast publishing. We've seen the publish preparation time of a good-sized gallery (around 2000 photos) drop from 5 minutes down to 3 seconds. Wow. We've also added some much requested preferences to control your key photos for Albums and Events. The dessert is for new users of Pomoto. For the next week, everyone who registers a trial account is entitled to 1 month of free, unlimited publishing to Pomoto. To claim your dessert, all you have to do is publish a picture of a turkey. Then just send us a link to your gallery and we'll make it happen. Additionally, on Thanksgiving day we'll choose our 3 favorite turkeys and give a full year of unlimited publishing to the lucky winners. Visiting family and friends over the holidays? Now's the perfect time to set them up with a Pomoto gallery of their own. Gobble, gobble! It took a bit longer than expected, but I've finally gotten ahold of Leopard and am happy to report that Pomoto runs just fine. Of course, if anyone has any problems, please be sure to let us know. Apart from the horrible default dock and translucency in the menubar, I'm enjoying Leopard quite a bit. Personally, I highly recommend putting your dock on the side (I'm a lefty myself) and using the 'Earth' background. Not only is it beautiful and in-line with the 'Space' theme of Leopard, but the top and left borders are completely black which makes the menubar and dock sane once again without installing any hacks. Well, in our rush to get out a version with support for Events, we let a few bugs slip in. So I've just released a true bug-fix release. If you have an empty 'Events' album on your gallery, updating Pomoto and clicking 'Publish' will get rid of it. This release should also fix the problem of giving false warnings about publishing without any photos selected. Sorry about those... nothing critical, but annoying nonetheless. As before, just open Pomoto or click 'Check for Updates...' from the Pomoto menu. Another change that was made was the way private albums work. Private albums now have no references or links back to your gallery. This is perfect for the situation where you want to share some photos of your last company party with a few colleagues without exposing your personal gallery. A few changes in the HTML and CSS were made to support this, so if your gallery looks a bit strange just force a refresh or empty your browser cache. To update, just start up Pomoto or click 'Check for Updates...' from the Pomoto menu. And of course, be sure to send our way any feedback or questions that you may have. I've been putting photos online for a long time, and I've tried a number of different solutions. From the perl and php scripts of yore to the social sites embedded in the translucent heart of today's Zeitgeist, nothing has ever seemed to really fit me. I even made my own attempts to create online galleries for my friends and I which turned out to be just as disappointing. Not because of any failure with the code, of course, which was a model of beauty and perfection. And I couldn't blame my apathetic friends, although I certainly attempted to do so. I hardly used the system myself. But I was starting to understand where my real issues lay. It pains me to take the time to organize and manage my photos in iPhoto, so I'm certainly never going to do it a second time online. Pomoto allows you to utilize that work that you've already put into organization. Just spent an hour picking 50 decent photos out of the 700 you took on your last trip to Dollywood? Publishing your new iPhoto album is 3 clicks away. I like pretty things. I'm a sucker for the sleek and shiny. If a tool or service doesn't look good, I won't use it. It just hurts too much. I'm also a bit of a symmetry and alignment freak. I hear others have similar problems with typography and color. If you're one of us, I feel for you, but I'm here to help. Pomoto offers clean, minimal theme designs that emphasize functionality through simplicity. And if you want to change things up, by all means go ahead! Pomoto produces valid HTML and offers complete theme creation and customization through CSS. When I post my photos online for friends and family, I want to be the focus. Me me me me me. Ads are out of the question. Also unacceptable is a littering of links to whatever service I'm using. And I couldn't care less about people with 'similar' pictures to me. Pomoto makes your gallery about you, not about us. Don't like our one tasteful link back to Pomoto? Get rid of it! It's your gallery after all.